WRC Rally cars which have proved competitive enough to make the podium, but never making it to the top step. I've checked all the way back to 1973 and to date 66 cars fall in to this category. I have 51 of them bought or built, with 15 still to go - one of which fills me with dread as it will need to be scratch built as nobody has made a base model. Nevertheless, i'm going to give it a go and to post up the pictures as and when I complete a year. It's been nearly 6 months since I last posted on this thread, but I have been busy (well, I have been for the past 2 months!). I've changed the picture for 1973 as I found a better photo of the Walker 142S Volvo Press on Regardless car which necessitated some redecaling. I've also identified another car which podium'ed in 1978 and have changed the picture for that year as well - the Kullang driven Opel Kadett C GT/E, this time in 2.0 group 2 spec. I've made this using a Solido base and homemade decals. Great models and a great idea Paul. You really come up with them. 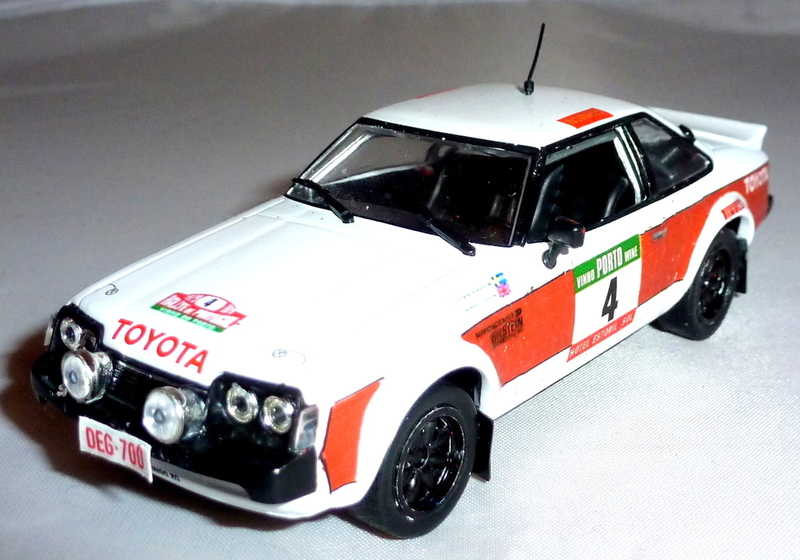 The two most challenging on the to do list at the moment are Possum Bourne's Subaru Leone from Rally New Zealand (no base car exists of the 4 door saloon so im probably going to have to convert a 2 door coupe/hatchback resin model) and Choteau's Bandama Corolla GT -bases for this are as rare as rocking horse doodah so i was banking on Minichamps bringing out their 2 door Resin corolla for a base sometime this century. Photos of Choteaus car are non existent so i will have to use screen shots from a WRC season video for this car. Patrick Tauziacs Starion Turbo is also a challenge when it comes to photos - i have a few low grade photos as a guide for this car though. Fantastic Theme Paul.........and the selection of cars is brilliant..........love every one of them........combined with your BRC winners you must be running out of space........i can clear a corner for you !!!!!!!!!!!! turn the wheel wrote: Fantastic Theme Paul.........and the selection of cars is brilliant..........love every one of them........combined with your BRC winners you must be running out of space........i can clear a corner for you !!!!!!!!!!!! You haven't room to swing a kitten not to mind a cat. paul stunning collection m8, v impressive!! Don't know how I missed the 2nd bit. Very impressive Paul. I don't know how I missed these 2! absolutely class collections and themes paul, well done m8!